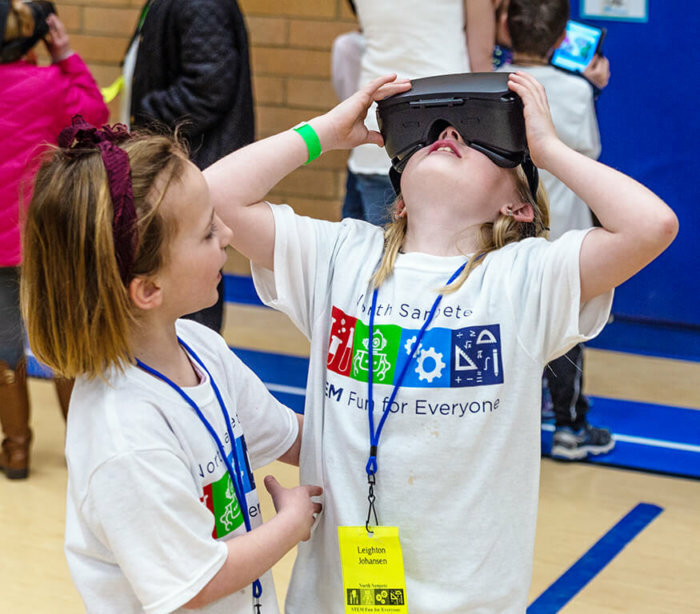 Students who tried their hand at the virtual reality booth at the STEM fest were paired up with a “VR buddy” to help steer them out from underfoot in the crowd of more than 140 students, parents and volunteers who participated in the event. MORONI—North Sanpete Middle School’s (NSMS) first-ever STEM Fest was a great success, school officials said. The event on Saturday, Jan. 26 was open to all K-8 students in the district. Learning sites were prepared by Ivory, other teachers and volunteers, which included more than 10 middle-school students and three high school Sterling Scholars—Carlee Nuttall, Savanah Wilden and Coldir Cox. 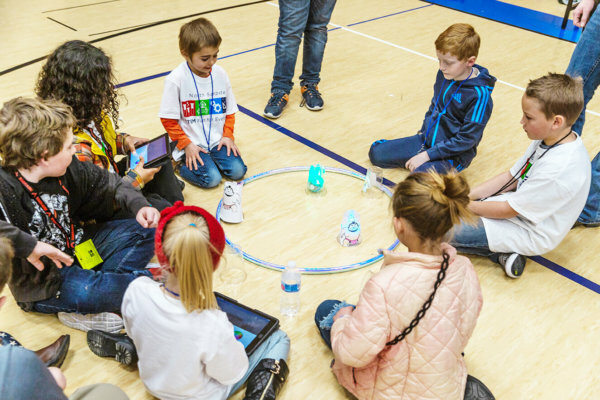 More than 140 children came to participate in activities such as virtual reality, augmented reality, engineering, math, robotics, coding, food science and more. Students were cycled through a variety of booths so they could experience each topic. All the teachers involved prepared their own activities, Ivory said, and all activities were hands-on. The STEM Fest was sponsored by the NSMS STEM Crew, a student club; the federally supported Gear Up program; and the district-level career-technical education (CTE) program. “I thought it was pretty fun and everyone had a good time,” said Braxton Allred, president of the STEM Crew. Ivory wanted to thank volunteers and educators who helped make the event happen, and based on the success of the STEM fest, she and other educators expect to stage similar events in the future. Students gather around the robotics learning area at the STEM Fest on Saturday at North Sanpete Middle School. 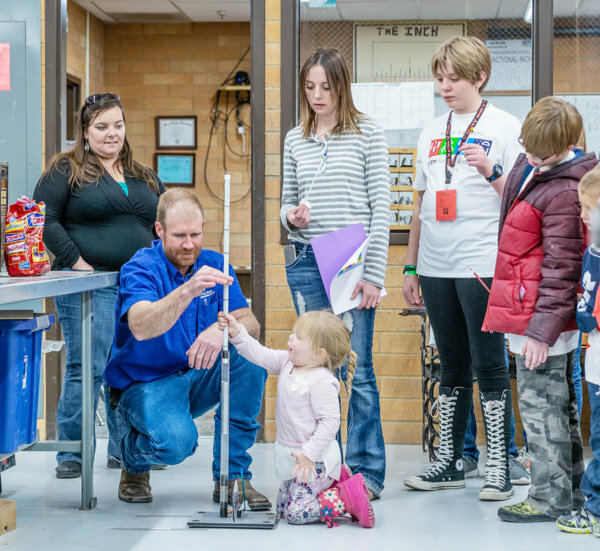 North Sanpete Middle School teacher Corby Briggs helps a student test her homemade straw rocket during a STEM fair last Saturday, Jan. 26. STEM stands for science, technology, engineering and math.